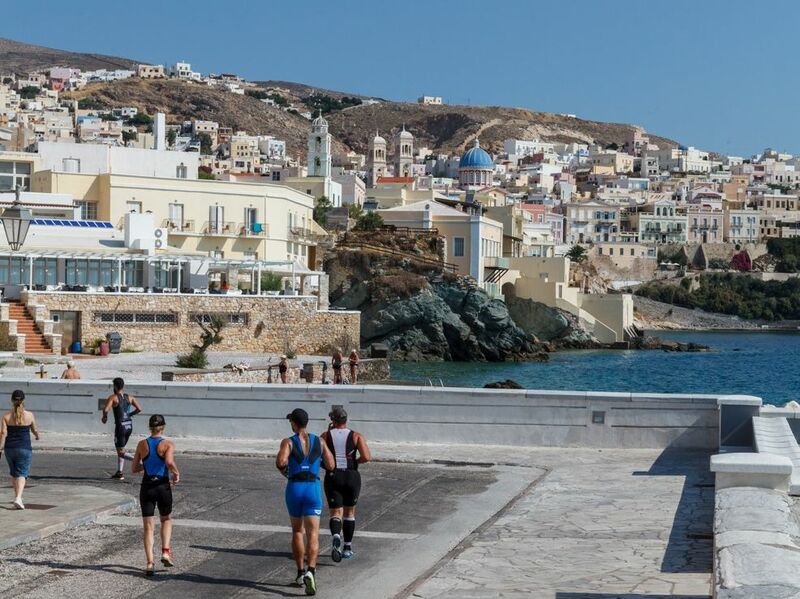 The island of Syros in the Cyclades recently hosted more than 2,500 athletes, coaches and attendees from eleven countries, during the 2nd Syros Trimore Triathlon. The four-day summer sports event (June 15-18) included a series of competitions for adults and children, focusing on swimming, cycling and running races, as well as parallel cultural and gastronomy events, which offered visitors the unique Cycladic experience. “Syros once more proved that with proper planning, it can become a major sports destination and attract visitors from all over the world; specifically in June or September, when the number of visitors is limited,” the Syros-Ermoupoli Municipality, co-organizer of the event said in an announcement. The Syros Trimore Triathlon 2017 began on June 15 with the 5,5 km open water swimming competition, which started from the Fabrika beach. A few minutes later the 3,5 swimming competition commenced from the Vari beach. The event also included an obstacle swimming race. The following day all athletes were transferred from Ermoupoli to the coastal area of Vaporia, which was the starting point of the Olympic triathlon. Next was the 20 km cycling race followed by a running race. Greek athlete Giorgos Alyfantis was the event’s grand winner. All winners were awarded during a special ceremony held on June 17 at the central Miaouli square in Ermoupoli. The last day of the 2nd Syros TRIMORE Triathlon was dedicated to the young athletes and included the children’s triathlon. The event was held with the support of the South Aegean Region and the Syros Nautical Club in collaboration with TRIMORE. Next year’s Syros TRIMORE Triathlon will take place June 21-24, 2018. The Greek Travel Pages (GTP) was a media sponsor of the 2nd TRIMORE Syros Triathlon.